Challenge coins come in all shapes and sizes! 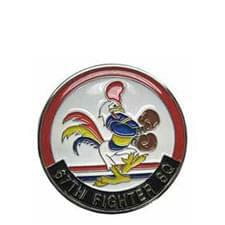 When it comes to designing your own unit or squadron coin, the possibilities are endless. With our free custom design process, we are ready to go right now, whether you have finished artwork or just a basic idea. Creating a new squadron coin has many variables, so we put this custom challenge coin guide together to help you explore the different possibilities. 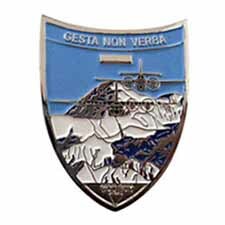 Start Your Challenge Coin Design or you may want to check out all our collection of Challenge Coins. Does size matter when it comes to your challenge coin? I guess it depends who’s looking! There is no one size fits all when it comes to challenge coins, however the standard is 1.75" diameter. 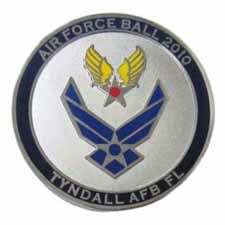 A larger 2" diameter coin is usually reserved for Commander coins and bottle openers. Here is a look at a coin diameters of 2", 1.75", and 1.5". You can go with the more traditional round coin, or you can broaden your horizons and stand out with something a little more unique. Coins can be made into unique shapes like shields, badges, squares, rectangles and more. If you can dream it, we can build it. Below you’ll see some examples of the different shapes that are possible. Coloring your challenge coin with enamel paint is a great way to bring your design to life! We can use any color under the rainbow. 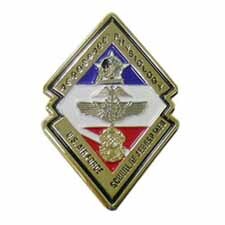 Keep in mind that you want it to reflect and include the colors of your squadron patch. Other colors can be added. The enamel paints are primarily chosen using pantone colors, using a Pantone Matching System (PMS) chart. PMS charts can be found online or we will be happy to email you a copy. You have many more choices than just gold and silver, when it comes to the finish of your challenge coin. There’s antique bronze, sandblasted nickel and chrome, just to name a few. Shiny silver, nickel, and gold plating are a great way to show the bling. 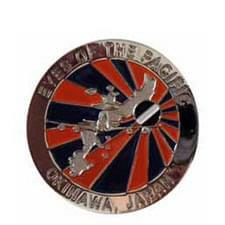 However, when you have a 3-dimensional sculpted design, the reflected glare makes it difficult to see the intricate details of the coin design. For our 3D designs, we recommend an antique finish. The artwork proof that our artists will create for your coin will show all areas and details of your coin. The legend at the bottom will reveal the many colors used. It will also show areas of raised and recessed metal. These areas will be represented by two different shades of the same base color, (ie. grays for silver plating) Try not to think of these shades as colors. They will both be the same color as the plating you choose for your coin. They simply denote which areas are raised metal and/or recessed metal. Raised metal will always be the plating of your coin. These areas cannot be painted. Many of the outlines and small details of your coin are raised metal. They act as a wall that holds the enamel paint and keeps it from flowing into the other painted areas. While recessed metal can also be the plating color of your coin, these are also the areas that will be painted if you decide to use enamel paint. The recessed areas act as a reservoir for the paint. Note: Some areas will be too small to be painted so will need to be represented by the plating of the coin. Many people often mistake raised metal for 3D imagery. There is a distinct difference. The raised metal of a coin is exactly that; a raised, yet flat surface above the main (or recessed) coin base. 3D imagery is a detailed component sculpted into the into the coin’s surface. This makes the image stand out distinctly from the rest of the coin. 3D relief, like raised metal will also be the plating color of the coin and cannot be painted. Certain images such as side views of aircraft look fantastic in sculpted 3D. Every now and then, we all have the need for a bottle opener! 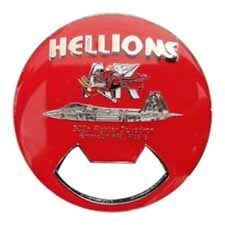 Instead of the traditional solid round coin shape, we will turn your squadron artifact into a unique bottle opener. 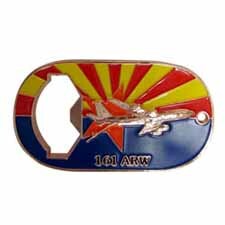 With this added functionality, you can proudly represent your squadron while also opening a tasty beverage. 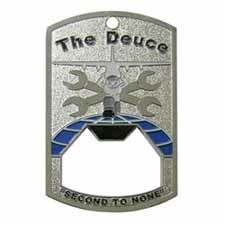 Here are some different examples of our bottle opener designs. Many manufacturers sell an epoxy coating on the false belief that this is an added protection that you cannot do without. At Aviator Gear, we strongly recommend against an epoxy coating, in most cases. The enamel paint and plating of your coin will definitely withstand general wear and tear. Epoxy tends to yellow over time and can dull the color of your coin, inhibiting the beauty of the enamel paint. It also has a tendency to develop air pockets or bubbles. If your coin has a photo insert or screen printing vice enamel paint, then an epoxy coating is necessary to protect it from the elements. Otherwise, let the beauty of your coin shine for all to see! Custom edges are very beautiful and catch the eye on special coins. Commander, Special Occasion, or Flag Officer’s coins are great ideas to incorporate diamond cut edging on. However, for your squadron, wing or maintenance coins, we don’t recommend this Gucci affect. While being very beautiful and eye catching, they are a bit too distracting and tend take away from the beauty and all the hard work that went into your coin. We suggest leaving the fancy edging for the fancy coins and letting your design speak for itself, which is what you had in mind when designing it in the first place! Sandblasting is a great affect that you can include in your coin design. If you are determined to have your coin only plated with no enamel paint, all the items on your coin are the same color and can be hard to see. Especially text. Sandblasting is a beautiful textured affect that will enhance the larger recessed areas of the background of your coin making the text and other small imagery stand out better.